Gaston, from France, who volunteered with us for four days, and Julia, from Germany, who volunteered with us for two weeks, have both just left the farm to return to their homes. We'd like to thank them both for their help during their time with us, and wish them the best for the future. Gaston in the packing shed, preparing beetroot for veg boxes. Julia in the Mothership, planting wild rocket seedlings. Standard veg box (£10, or £11 delivered to your door) contained a "marvel of four seasons" lettuce, a bunch of "French breakfast" radishes, a kilo of "Sarpo Mira" potatoes, some parsnips, a bag of white sprouting broccoli, a bag of fresh coriander, a bag of watercress, some beetroot, and leeks. Small veg box (£6, or £7 delivered to your door) contained some beetroot, leeks, spring greens, a kilo of "Sarpo Mira" potatoes, a swede, and some parsnips. All of the produce in last week's veg boxes was grown by us on the community farm. Pendeen, 10am till 1pm, on the first and third Saturdays every month, where we sell a range of fresh veg, plus eggs (when available), honey, and a small selection of fairtrade/organic/local produce. St Just, every Saturday, 9:30am till 12:30pm, where we sell a range of fresh veg, plus eggs (when available), honey, bread, and a small selection of fairtrade/organic/local produce. Sennen, every Tuesday, 9am till noon, where we sell a wide range of local/organic/fairtrade produce, plus salad bags, eggs (when available), and plants. Please support your local traders, farmers and producers by shopping at your local markets! Pictured above is our £6 veg box from Friday, which contained potatoes, rainbow chard, leeks, Jerusalem artichokes from the community farm, and carrots and a savoy cabbage from a local organic farm. The £10 box contained potatoes, leeks, Jerusalem artichokes, spring greens, carrots, swede, savoy cabbage, and purple sprouting broccoli. 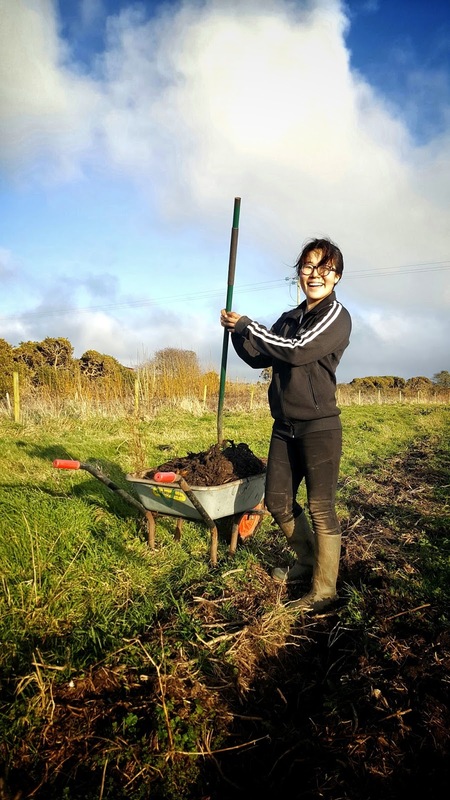 Sei, from South Korea, wwoofed with us for two weeks, but left last Wednesday to return home. 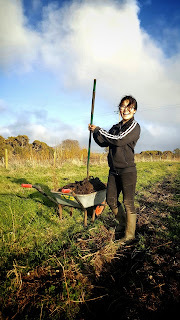 Many thanks to Sei for her hard work and ready smile whilst volunteering with us! Steve, from Kendal, and Amy, from Plymouth, finished their volunteering stints on the farm last Monday, after 12 days and 5 days with us respectively. We'd like to thank them both for their contributions during their time with us, and wish them both well in their onward endeavours. Steve (centre left) and Amy (far right), helping Maria (far left) and Sei (centre right) relocate a wind-break on the market garden last Saturday. Today's £6 veg box - carrots, beetroot, potatoes, leeks, lettuce, and rainbow chard - with optional extras of free-range eggs (£1.60) and one litre of local organic milk (£1.25). Today's £10 box contained potatoes, red cabbage, beetroot, chard, kale, leeks, carrots, lettuce, radishes, and spring greens. Last week's small £6 veg box - Sarpo Mira potatoes, leeks, Red Russian kale, parsnips, oriental greens, and a cauliflower from Cargease Organics. Last week's standard £10 veg box - Sarpo Mira potatoes, purple sprouting broccoli, leeks, Chinese cabbage or a lettuce, parsnips, spring greens, fresh coriander, swedes, and some carrots and a cauliflower from Cargease Organics.